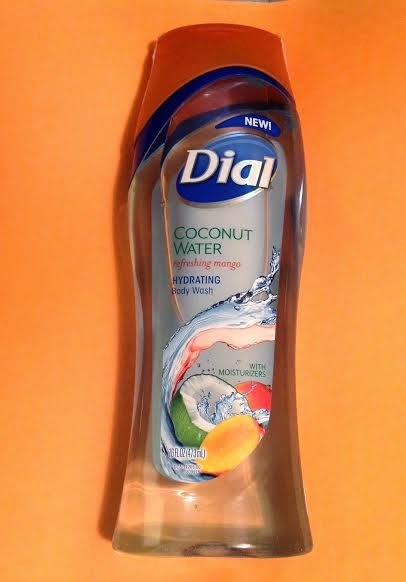 I recently received a sample of Dial Coconut Water Refreshing Mango Hydrating Body Wash. I love anything mango. I spent a summer in Asia in 1997 and I was on the mango bandwagon well before anyone else in the United States seemed to be. So I jumped at the chance to review the new Dial Soap Body wash. If it's mango or mango scented, I'm right in line for it! Another thing I like is it's a fruity scent so it's a great family body wash. This is a clear body wash, which isn't always my favorite because without glasses in the shower I'm not always sure how much I'm using, but that's the only thing I didn't like about this. I really like how slick it is, I can really tell it's a moisturizing body wash. Dial is a brand I trust, I have used it my whole life, and I'm excited they have added this nourishing body wash to the line up of skin care products for healthy skin. It's something I'll definitely be buying in the future. FTC disclaimer: The Dial brand provided me with a sample of Dial Coconut Water Refreshing Mango body wash in exchange for a product review. However, all the opinions expressed here are my own. One winner will receive THREE totally free coupons for Coconut Water Refreshing Mango Body wash 11.75 ounce size or larger with a maximum valued of $4.49. These expire on September 30, 2014. Open only to the United States. Winner has 48 hours to respond to the e-mail or another winner will be chosen. Ends 8/10 at 11:59 pm. I would also like to try the Greek Yogurt Vanilla Honey Moisturizing Body Wash. I love coconut and I love body wash - great combo - great giveaway Jenn! I love the Vanilla body wash. I like the Dial Men's Scrubbing Power Body Wash.
My favorite is the Greek Yogurt Vanilla Honey Moisturizing Body Wash. I really like the original coconut water body wash, I use it all of the time! I love the Twilight Jasmine and Lavender body wash! I want to try the new Dial lotion with Greek yogurt! The Spring Waters scented body wash sounds like it'd smell great! I'd like to try that scent as well. Thanks for the opportunity. I really like the Lavender & Twilight Jasmine and all the Dial Body Washes help keep you fresh all day. I would love to try the Greek Yogurt 7 Day Moisturizing Lotion. I would like to try the Light Citrus Moisturizing Liquid Hand Sanitizer from Dial. We love the Dial Greek Yogurt Vanilla Honey Body Wash and use it daily. I've used Dial Antibacterial Foaming Hand Soap for a long time and really like it. I would like to try the Spring Water Antibacterial Bar Soap. I would like to try Dial® Acne Control Face Wash.